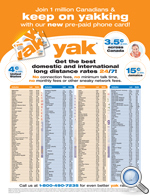 Brand New From Yak Communications: You can be the first to try the Yak long distance card. 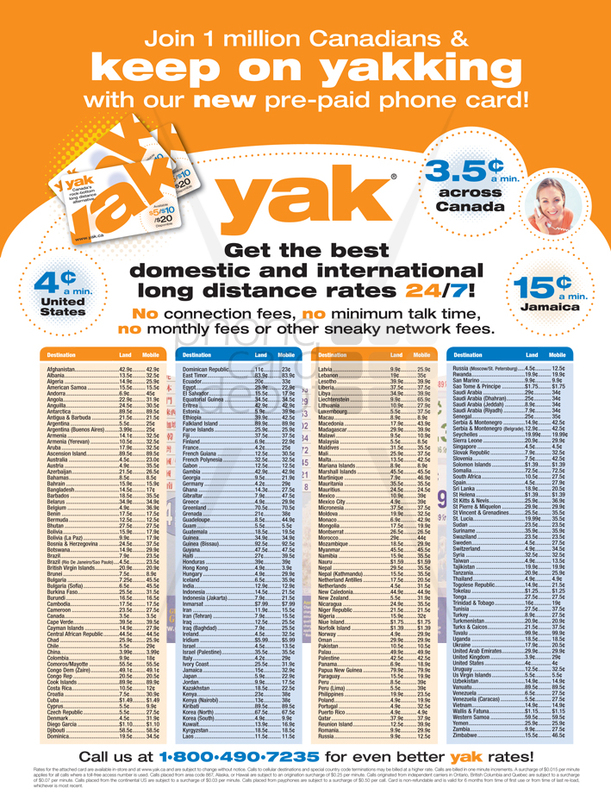 General Information: Yak allows you to call from anywhere in Canada to anywhere in the world with its great rates 24/7. Yak's rates are low with no connection fees, no minimum talk time, no monthly fees or other hidden fees. The line will never be busy when you call the Yak toll free access and/or Canadian local access numbers. From the phone company that over 1 million Canadians already trust. INPUT: Dial local access number. PROMPT: Dial your destination number (for international calls, dial 011 + country code + city code + phone number). Fine Print (as seen on the back of card): Rates for the attached card are available in-store and at yak.ca and are subject to change without notice. Calls to cellular destinations and special country code terminations may be billed at a higher rate. Calls are billed in one minute increments. A surcharge of $0.015 per minute applies for all calls where a toll-free access number is used. Calls placed from area code 867, Alaska, or Hawaii are subject to an origination surcharge of $0.25 per minute. Calls originated from independent carriers in Ontario, British Columbia and Quebec are subject to a surcharge of $0.07 per minute. Calls placed from the continental US are subject to a surcharge of $0.03 per minute. Calls placed from payphones are subject to a surcharge of $0.50 per call. Card is non-refundable and is valid for 6 months from time of first use or from time of last re-load, whichever is most recent.